As San Francisco Police Chief Bill Scott puts more foot patrols on the city’s streets, he’s also looking to increase the eyeballs on crime. To demonstrate how serious he is about the community’s role in policing, he showed up at a recent meeting of neighborhood watch block captains — residents who organize some of the over 900 watch groups across the city. In Ingleside, there are about 19 neighborhood watch groups, which incorporates Merced heights and Oceanview, and a few in the Excelsior and Outer Mission, according to the Neighborhood Watch Map. While Scott said he’s more than doubled officers walking through communities — “from 70 to over 100 to 150 foot beats” — getting help from residents remains key. “We are developing a strategic plan. We have been soliciting people from the community,” Scott said as he spoke about engaging communities in neighborhood safety. The police department’s focus on community policing, he said, was somewhat disjointed in the past. Now it is run by the community engagement division, and neighborhood watch groups are a way for residents to participate. Scott said he was concerned about property crime. The city had the fourth highest rate of property crime when compared to other cities in 2015, according to the Citywide Benchmark Report. The neighborhood watch groups are formed with the help of the San Francisco SAFE Program, a nonprofit that has been working with the SFPD since 1976 and receives most of its funding from the police department. The block captains set up meetings with their neighbors to discuss issues such as burglaries, car break-ins and other property crimes. They act as watchdogs for suspicious behavior using guidelines from SAFE. Someone walking along lines of cars, for example, could possibly be searching for a way to break into those cars. SAFE advises that the person who notices this reach out to their neighbors, and report it to the police. The block captains have ties to the police captain. 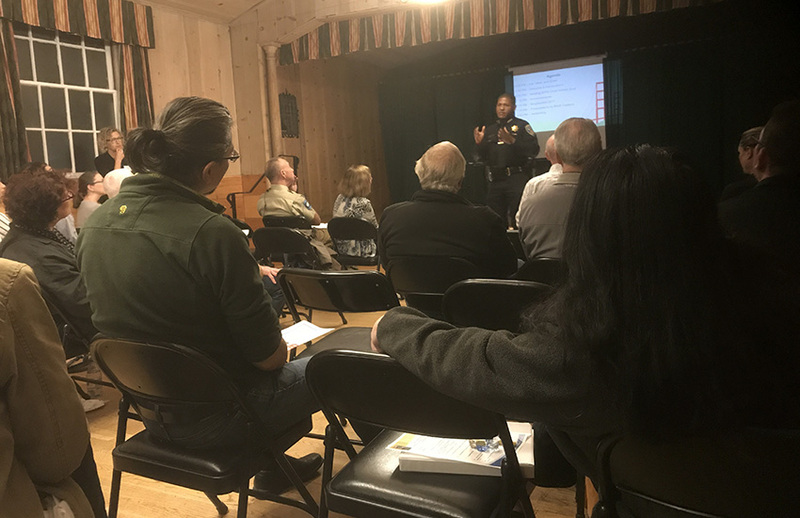 Generally, a neighborhood watch group starts with at least two people who experience or witness incidents in their community and want to build stronger ties with their neighbors, according to Adam Cuadra of SF SAFE. Once block captains have assembled a group of interested people they create a committee and schedule a meeting with a SAFE representative. “We want to empower residents to take back their neighborhood,” Cuadra said. Diana Yee recently started a neighborhood watch for her community on the 300 block of Raymond Avenue and Visitacion Valley after several burglaries occurred in her community. Some 30 people showed up at her first meeting, bringing chairs, food and a PA system. A SAFE representative provided an introduction to how the organization works. After the first meeting, the group problem solves issues in their community with police and other agencies. Another new block captain, Mark Welsh said, “Right out of the gate, we were able to get Capt. McFadden to our meeting,” referring to the Ingleside captain. Welsh and members of his neighborhood watch were able to walk the police beat and learn how to protect their homes and garages. “The format of the program is really structured,” Yee said. She and other members completed a residential security survey with a member of SAFE, who walked with them around their neighborhood and gave them recommendations on how to observe different activities and eye suspicious behavior. Yee agreed that McFadden takes the groups seriously, and he showed up at one of their meetings. “For McFadden to come felt like the queen was coming,” she said. Yee said there’s a 90 percent participation rate on her block. Applications such as Doodle and Nextdoor have been a way for people to disseminate information. While the SFPD’s involvement in community policing has its fans, some community members in the Excelsior said such issues should be left to the community members alone. Melissa Reyes, program coordinator at the Filipino Community Center in the Excelsior, said the center was established because of the large concentration of Filipinos in the district. Reyes said education not only makes the community safer, but also assists in combating bias. The anti-immigration fervor has also made some of her members fearful of the police. But Adam Cuadra mentions that this relationship between police and the public is important. “It’s a two-way street,” Cuadra said when speaking about the involvement of the public in making their voices heard.